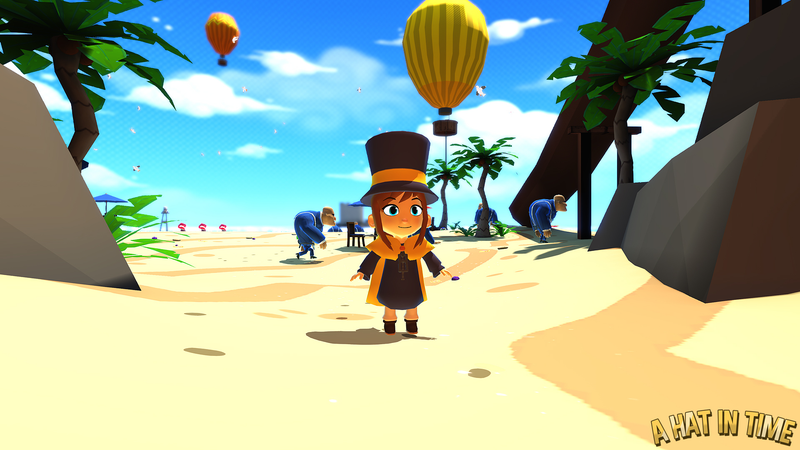 In the months that followed the successful A Hat in Time Kickstarter and being Greenlit for Steam, the Indie Developer team Gears For Breakfast has been busily working away on the game that stars the charmingly adorable Hat Kid. Lead 3D Environment Art Director, William T. Nicholls took a few moments from a busy schedule to discuss the Alpha release that hints at new game mechanics, stellar music, a creepy mansion and a familiar sounding penguin. It's been a while since Kickstarter and being Steam Greenlit. What has Gears for Breakfast been up to since then? After the success of our Kickstarter Campaign in July 2013 we had to re-adjust to working again as that period was quite the eye opening experience. We received a lot of positive feedback and because we are a small team of nine people it was a lot of work to reply to everyone who contacted us. It was very uplifting to have so much attention and it helped motivate us throughout these past months. Afterwards we immediately continued working on certain chapters and we grew as a team as the months went by. Our techniques improved and our work production increased thanks to the support of the Kickstarter backers. We kept our fans updated on Facebook and Twitter but besides that we kept a low profile so we could focus on our work and release the public alpha within a reasonable time span. What has been the biggest challenge thus far for the team? That's an interesting question! Keep in mind that as a team we all work from various different locations so we don't always get to discuss these things. We have members in America, UK, Denmark, New Zealand and Australia. So while I can't answer for the team, for me personally, it was creating "Mafia City". Back when I joined in March 2013 I was tasked with making the environments for the game and started off with the "Mafia HQ". I had just finished creating a realistic Counter-Strike level for the Source Engine and re-adjusting to both the art style and the Unreal engine was quite difficult for a while. But I eventually got the hang of things and that's when I was talking to Jonas Kærlev (Director) about the current city level. It was created before I joined and after working on it for a short while I expressed concern that it was too small and not laid out very well. The original level was more box shaped but it featured ideas that crossed over into the final version. For example the HQ sat on top of a mountain in the middle of the sea. That is when I pitched the idea of a "Mafia HQ on top of a volcano geyser" and immediately Jonas gave me the OK to flesh the idea out. And from there it took many, many months to develop Mafia City into what it is now. Due to its size it took a lot of effort on my part and became a sort of inside joke within the team as my days were mostly spent tinkering away at that huge city! I hope our fans appreciate the work that went into it and take a moment to look at the structures and detail that cover the city. We worked hard to add "Environmental Story" where more is said in what you see in your surroundings rather than what is told to you in dialogue. Mafia City is beautiful with its bright blue skies, colourful characters and cobbled streets. It's light and airy! Then there's that creepy Mansion. I was not aware there was an element to survival horror here in your 3D Collect-a-Thon. It's downright scary! Were there any influences for that level? How fun was it to design the level? I'm glad you think it's scary! That is the emotion we wanted to evoke the most when we designed Vanessa's Manor. Jonas was the genius behind the idea of Queen Vanessa and her Manor so I don't know what went through his mind when designing it but I can tell you that inspirations such as Luigi's Mansion played a part in the way you control Hat Kid in that level. Another fun fact is the animation where she tumbles to the floor and crawls backwards is a neat reference Luigi's Mansion Beta and die-hard fans will recognise it. The overall design for Queen Vanessa was created by our concept artist, Shane Frost and he is an absolute genius when it comes to the abstract and the strange. The music by Pascal Michael Stiefel also helps really define the horror of Vanessa as she stalks the hallways in search of you. I think he really nailed that suspense in the form of music. Otherwise the actual development of the floors was an interesting challenge. Unlike Mafia City, this level has a fixed camera and doorways which act as gateways that lead into other rooms. We had to work out the best way to make it flow and one of the fun tasks I had to do was create several specifically shaped black planes that were placed between each room. They were used to block the camera and stop players from peering into nearby rooms which would have given them an advantage when avoiding Vanessa. Jonas had a fun time testing out puzzle ideas and we did unfortunately scrap a few but that's just how the development cycle is. I also had the pleasure of testing them out for him and it was entertaining breaking his sequences and giving him feedback. Otherwise we felt it was traditional to have a "spooky level" straight after the colourful Mafia City as a sort of contrast. I hope that our fans pay close attention to the details. There's quite a "foxy" story to uncover if you look hard enough! I noticed there are badges that Hat Kid has been stylishly adding to her hat. Can you tell me what those are for and how do they affect gameplay? It's funny to finally see those badges in the game! Back in July 2013 when we showed the prototype there were "electric badge pieces" that the players could pick up. We only recently showed them to the public and now that the alpha is released they can try a few of them out! As the players progress through the game they will be able to collect various badges via different methods such as beating an act or completing a secret level. The player can then equip up to three of these unique badges on her hat. They grant her certain powers or abilities and it is our hope that players will be able to mix and match pins to find a combination that suits their play style. In the alpha players can try out the "electric pin" which zaps enemies who attack you, the science badge which allows you to throw explosive test tubes and finally the Snatcher badge which teleports you in the direction you are facing. Speedrunners in particular may find it useful. During our testing we also found it made certain boss fights more interesting. The electric badge in particular changed the way you fight one of the unannounced boss battles and it was a welcome change that we did not expect! We're planning on adding a large variety with really fun powers so I hope that puts across just how cool the badges are! The music in this game has thus far has been mesmerizing, aptly fitting to match the charming aura of Mafia Town with a modern sounding twist - and still really terrifying! - in its approach in Queen's Vanessa's Mansion. There's also that wonderful tune that plays when the credits roll in a very interesting scene at a bookstore. What can you tell me about the music? And if you can, that bookstore scene - what does it all mean?! The music so far was composed by Pascal Michael Stiefel who has worked extremely hard to bring us the tracks you have heard in the alpha build. As for the bookstore music, that was composed by Jonas Kærlev's brother, Mathias Kærlev though the song itself has a certain meaning that I will not share because as a wise Time Traveller once said..."Spoilers!". The style of the music really helps set the mood of the game such as the tropical Mafia city with the sunny clear sky and the underwater sea with its blue, crystal clear water. And then you have Vanessa's manor which is quite the opposite with darker tones and disturbing noises that emphasize you are being chased by an evil dark queen. The bookstore itself has many meanings...Though it is up to the players to decide what they are. What I will say is that there are several clues in that small area that may help paint a picture of the future. The bookstore name could be one of them but who knows...I actually chose that name for a reason...Hehe. Speaking of music, the fans met the "Grant Kirkhope Goal" to have a song of his be specially crafted for the soundtrack! It's quite exciting for the fans as it is for your team, I'm certain. Has his music had any influence in directing any of the game's style? Indeed! He has created the main theme for the game and his use of the "theremin" has given our game a "spacey sci-fi feel" to it which we've transferred to some of our main songs such as the boss battle music in Mafia City. He's a fan of the game and has expressed delight that we're trying to bring back the classic collect-a-thon platformer genre. Otherwise we're still continually working with him and it's been a pleasure so far! There's a penguin with an awfully familiar sounding voice that makes an appearance in Mafia Town. What has it been like being able to work with JonTron? Hehe it's been a pleasure! Although to say we worked with him is a bit of a stretch because we actually asked him to do the voice of another character but we felt it didn't match so we tried the "Jazzy Penguins" and loved it! He recorded the lines for us and that's as far as it went. I have to say his voice is really good! Very distinctive and I am sure people recognised it as soon as they talked to him! I hope people enjoy his character more when it's fleshed out in the beta / final game. Who doesn't like a Jazzy Penguin in a suit!? A Hat in Time is all about time travel and time mechanics. Did Gears for Breakfast draw any inspiration from some of the greats such as Chrono Trigger, Majora's Mask or Doctor Who? Majora's Mask for sure! We actually mentioned that in our Kickstarter video back in July 2013. I like to think Chrono Trigger played a part in my ideas and designs but our main sources of inspiration are Mario 64, Donkey Kong 64, Banjo Kazooie / Tooie and Zelda OoT / Majora's Mask. Quite a list right? Well they are the finest games of the Nintendo 64 generation and many of our team members grew up playing them, myself included. Doctor Who...Well we did cut out a pun that we felt wasn't very amusing. A doctor character named "Dr Hoot" but I don't want to talk about it hehe. Overall though, you're exploring these worlds and collecting Time Pieces in similar fashion to those great classics and we hope our older fans feel a sense of nostalgia while newer gamers experience a genre that defined gaming for us in the 90's. Watching some of the many playthroughs on YouTube, the Alpha build seems to have been very well-received. What were some of the most fun, or interesting learning experiences the Team has come away with? Bugs. Lots of bugs. Bugs...everywhere! But you are right, we have had a lot of positive feedback and this tells us we're going down the right path and that we're delivering what we promised last year. I think the lesson we have learnt is not to underestimate the players. Let's just say one of my puzzles was beaten quicker than I could blink and the alpha has been absolutely torn to shreds. I have had people email me showing the off-limit places they have been and I both smiled and looked confused since I was pretty sure I made sure to stop people from going to these places! Shows what I know! Otherwise the team has enjoyed watching people play it and record their reactions. Especially when they play through Vanessa's Manor! We had some good laughs as players screamed "WHY Gears for Breakfast! Why would you create this chapter!!!" so if there's anything to take out of this...it's that we know how to scare people out of their skin! What can we expect in the future from A Hat in Time? "Future". I see what you did there. We've worked very hard on this game and so far a year has passed for me and even more so for Jonas and the rest of the team! We have still got a long road ahead of us but such quality demands time and we're happy to work towards it as long as the fans continue to support us and let us know their thoughts! Honestly though I can't express enough how much the support helps! We make games not just for ourselves but to entertain and inspire new generations so they can carry on the torch. Perhaps one day there will be a crowd sourced project that aims to bring back the "Hat in Time" genre! We are all excited to see this game finished and I understand people are interested in seeing the game on other platforms besides the PC. As always I can only tell you that "we hear you" loud and clear and we're working towards it but until we are able, we can't share any more info and I hope our fans understand and appreciate why. Otherwise we are enjoying people reacting to the alpha and while they play it we will continue working on the game! Thank you for the interview, Zarnyx and I hope you are enjoying the alpha.